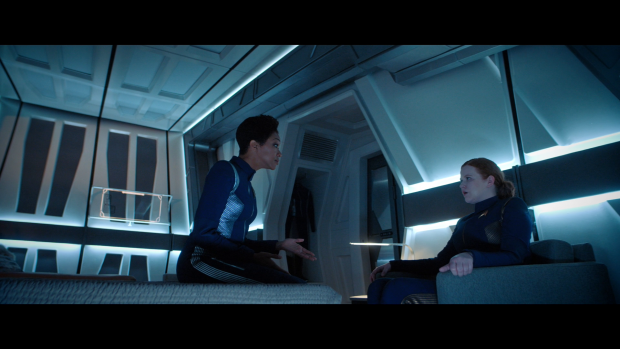 Star Trek: Discovery checks in with L’Rell and Tyler and Amanda pays a visit to the Discovery to enlist Burnham’s help in resolving the Spock situation. Last season ended with L’Rell seizing power in the Klingon Empire by having her finger on the detonator of a bomb that could wipe out the Klingon home world. It could be said that this isn’t the most honourable way to ascend to such a position though it was arguably necessary to do so considering how divided the Klingons were as a species. Since the basis for her leadership is leverage it’s no surprise that other Klingons don’t approve of it. Another thing they don’t approve of is her affiliation with Voq/Tyler -hereafter referred to as Tyler-. Even though he was originally Klingon he is still seen as Human and therefore not to be trusted. L’Rell holding him in such high regard is seen as weakness and makes the tense political situation even worse. This plot is very Shakespearean which fits with prior depictions of the Klingon political landscape. There’s lots of grand speeches, betrayal and the proceedings are all very theatrical in their execution. It has to feel larger than life in order to be accepted and this is certainly accomplished. Part of the problem with the episode as a whole is that it feels disjointed in terms of the vastly different narratives vying for dominance. Engagement with the Klingon material will entirely depend on how you felt about the internal machinations of the Klingon Empire last season. For me it was hit and miss and I certainly struggled with aspects of this. As always I find myself drawn to the characterisation more than the storytelling and this is largely well done. The relationship between Tyler and L’Rell is interesting because Tyler is so conflicted over his own identity that he doesn’t know how to deal with L’Rell. On one hand he remembers romantic -at least in a Klingon sense- walks with her to some beautiful ancestral cliffs but on the other he can’t shake the feelings of revulsion that come with his memories of being brutally tortured by her. He refers to her kissing him feeling like a violation so there is a significant conflict in regards to his feelings for her. Despite this he’s devoted to her because he believe whole heartedly in keeping peace with the Federation and understands that he has a part to play in that even if the majority of the Klingons don’t accept him. L’Rell’s main opponent is Kol-Sha (Kenneth Mitchell who also played his son, Kol last season) who looks to find leverage against L’Rell to weaken her position as Chancellor. He ends up learning that Tyler and L’Rell have a child that she has been protecting so kidnaps the baby in order to force her into stepping down as Chancellor. This results in a brief and bloody conflict that quickly goes south for L’Rell and Tyler until a mysterious hooded figure revealed to be former Emperor Phillipa Georgiou now working for the Federation’s black ops division known as Section 31. Section 31 was introduced in Deep Space 9 as an organisation tasked with protecting the Federation at all costs. It also featured in Enterprise and Star Trek Into Darkness. It’s an interesting idea in theory but the prior appearances have been more about the moral ambiguity and the mystery rather than the practicalities. 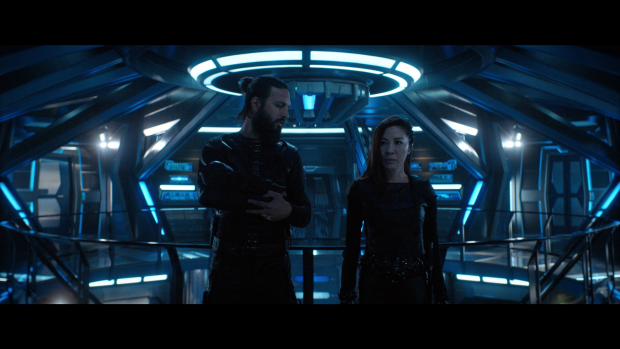 Now it looks like we’re getting an entire TV show headed by Michelle Yeoh that will flesh out Section 31 in a big way and this episode looks to be something of a tease for that. Georgiou’s introduction was awesome with her unconventional looking transporter beam and tactical drone impressively cutting down on the resistance. Her appearance is surgical as she outlines her purpose to both Tyler and L’Rell. It’s in the Federation’s best interests to have L’Rell as Chancellor for now so Georgiou intervenes to ensure that she stays in power. It’s neat, clear and a clear breach of the Prime Directive though that is why the organisation exists and there’s no better person to carry out those actions than an amoral intruder from the Terran Empire controlled alternate universe. As great as this was it gets in the way of Tyler and L’Rell resolving the problem that they were presented with in this episode. Rather than using the resources at their disposal they find that someone else appears to solve it for them which robs them both of a great deal of agency though it could be a sign that L’Rell lacks the necessary objectivity to make the necessary choice. Georgiou doesn’t give her a choice and makes it very clear that she has to remain in power in order to maintain peace between the Klingon Empire and the Federation. Basically she can’t have a family and rule the Empire because others will always see that as a weakness and look to exploit that. As long as Tyler is around then there will always be an assumption that her decisions are actually the work of Tyler. The resolution to this is actually really interesting and makes good use of Shakespearean storytelling through her speech towards the end. She paints Tyler as a traitor who needed to be stopped and Kol-Sha as a hero who bravely fought to save her life. In essence she tells them what they want to hear and shows them convincing enough evidence to pacify any detractors. With that she pledges to never bear another child because her devotion to the Empire is so great and declares herself Mother of the Klingon people. It’s a bold declaration that is unfortunately met by an insanely cheesy chorus of half baked cheers but I’m intrigued by how Tyler not being a part of L’Rell’s story will affect the Klingon plot. Tyler sending the child to be raised by the Klingon Monks in the Borath Monastery feels somewhat appropriate as Voq was fully committed to following the ways of Kahless and these monks are fully committed to those teachings so sending him there to be raised is the best outcome for both him and L’Rell in making sure their child has a good life. In terms of giving Tyler something to do Georgiou suggests that he join her in Section 31 as he is comparable to her in that he doesn’t belong anywhere. I wonder if this is a tease for his involvement in the Georgiou lead series or if there will be an arc that concludes in some way over the coming episodes. Back on Discovery, lip service is given to the Red Angel mystery through the arrival of Amanda who has recently tried to visit Spock in the psychiatric facility but has been denied access. She saw the only logical course of action to be stealing his medical file and petitions Burnham to break into it for her. This is something she refuses to do on principle but a quick visit to Pike leads to him ordering to do so after learning that he apparently broke out of the facility killing some Doctors as he escaped. This behaviour sounds very Spock like so the medical report is seen as the only clue they have to finding him and possibly explaining his behaviour. All of this is very plot heavy and contributes to the ongoing mystery of Spock’s connection to the red bursts which is somewhat essential to add something to this plot without simply repeating information we already have. The mechanical nature of the plot is expertly countered by a fascinating emotional story that furthers the Burnham/Amanda relationship. Up until this point the bulk of the focus has been on Burnham’s relationship with Sarek so exploring her relationship with Amanda is most welcomed. There’s a clear difference right away as Sarek’s version of affection is clearly more calculated where Amanda’s comes across more like unconditional love. It’s almost as if she displays a lot more emotion to make up for the lack of emotion from Sarek. As a parental unit it clearly works as each of them bring something important to the table. Amanda’s insight into her own failings as a parent are really interesting as well. She talks about making a conscious decision to suppress her own emotions to honour Sarek’s ways without realising that Spock would grow up feeling starved of affection. Burnham points out that they were definitely loved by her and it was appreciated. All of this might have been better explained with a flashback as the episode spends more time telling the audience about the character history rather than showing it though this is barely noticeable thanks to excellent performances by both Sonequa Martin Green and Mia Kirshner who both display a complex history in they way they interact with one another. The Red Angel mystery receives further weight to it when Amanda tells Burnham that Spock talked about the Red Angel appearing to him and told them when to find her after she ran away following a Logical Extremist attack. It was assumed back then that he had simply worked out the most logical place she could be considering the available information with the Angel being a figment of his imagination but recent information suggests that there’s more to it than that. 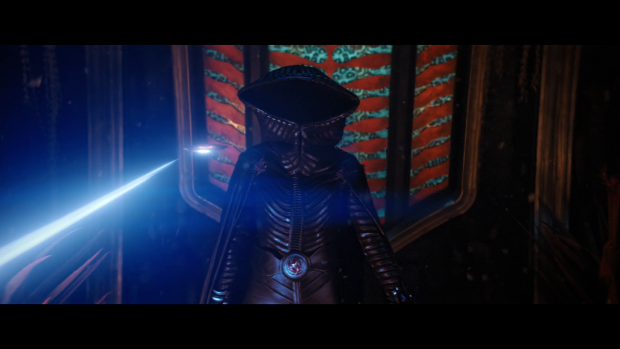 This suggests that Burnham is also connected to the Red Angel considering it appeared to Spock in order to save her and appeared to Burnham in the first episode of the season. At the very least there’s definitely an intelligent at play that has a purpose behind its actions albeit a mysterious one. Amanda assumes that the Red Angel vision was what made Spock close himself off from everyone around him but Burnham tells her the true reason. The Logical Extremists were actively targeting her as a child because she was a Human being raised by Vulcans and she didn’t want Spock to be accidentally hurt or worse through proximity to her. At this point in their lives he was apparently ver much her shadow so she had to do something to discourage him from following her around which, to her, meant hurting him in a really profound way. 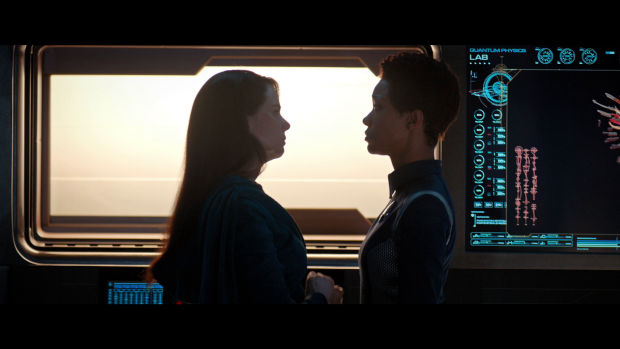 She doesn’t reveal what that was to Amanda because she considers that to be something between her and Spock but it’s clear that what she does know is shocking enough for Amanda to step away from this interaction. Burnham doesn’t apologise for what she did but does point out that she has tried to make things right for years with no success and resolves to do everything in her power to find Spock in order to make things right. Amanda counters that by declaring that she’ll be the one to help Spock and leaves. This makes for a fascinating rift between these two characters that will hopefully develop as the season progresses. Certainly for now there’s a strong basis for Amanda to be involved in the plot. The voice in Tilly’s head introduced last week gets some form of a resolution in this episode. I was surprised that this happened so quickly though I’m not sure what more there is to do with a character continually talking to someone or something that only they can see and interact with. The Battlestar Galactica reboot did a lot with this concept so I wonder if this was only introduced as a stepping stone to something greater as it certainly feels like the episode is in a rush to deal with it. Tilly’s first appearance in the episode has her haunted by May (Bahia Watson) during a half marathon in aid of the Officer Training Programme. Despite the interruption she wins and achieves her personal best which could suggest that this presence in her head encourages her to push herself in a way. This is quickly abandoned in favour of run of the mill lunacy when she appears to snap at Pike during a different exercise before eventually confiding in Burnham about the problem that she has. From here the episode jumps right into solution mode and very quickly moves this onto the next phase. This moves a little too quickly as Stamets comes to the conclusion that she is infected by a fungal life form without having a lot of information. Remarks made about Stamets being the Captain as far as the consciousness attributed to the spore was concerned were interesting in theory as they also came with the suggestion of Pike being an imposter though this appears to be little more than ramblings in order to indicate that the spores consider Stamets to be the greater authority. Now that the life form is out of Tilly I suspect it will factor into the ongoing plot in some way but the setup feels far too abrupt and might have been better served as part of another episode. An interesting episode that has a lot going for it in terms of plotting and emotional connection to that plot but feels disjointed in the differences between the featured stories. Engagement with the Klingon material will entirely depend on how you engaged with it last season but there’s a lot going on here that works. The plotting is Shakespearean in the way its presented and the complexity of Tyler’s relationship with L’Rell is really interesting to watch. His devotion to her and the idea of peace with the Federation contrasted by feeling as if he’s being violated every time he touches her is fascinating as it shows there is no simple fix for what was done to him. 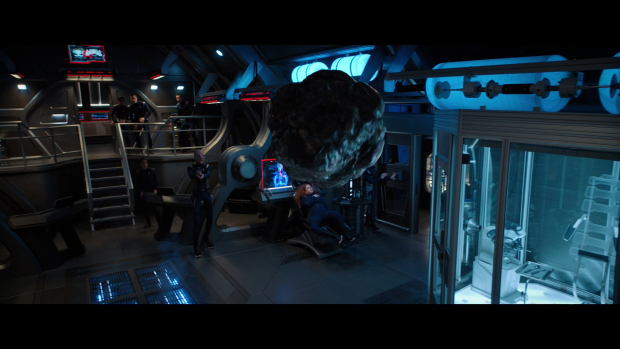 The reveal of the baby adds further complications and matches the leverage L’Rell has with her doomsday button. Georgiou’s intervention makes for a neat solution to L’Rell and Tyler’s plot that robs them of a lot of their agency though ably sets up the upcoming Georgiou lead Section 31 series. The appearance of Amanda allows for a fascinating spotlight on the relationship between her and Burnham. Prior to this the focus has largely been on Burnham’s relationship with Sarek so giving time to this is certainly welcomed. There’s a lot to unpack from this from her perceived failings as a mother to learning the truth behind Spock closing himself off from everyone around him. This creates a rift between Burnham and Amanda that has lots of potential for development. The ongoing Red Bursts and Red Angel mystery is further developed with little in the way of repetition as well and continues to be connected to the characters. Tilly ridding herself of the fungal life form living inside her and haunting her through the manifestation of May, a figure from Tilly’s childhood feels very rushed though it’s good to see that the “voice in my head” tropes are avoided even if they aren’t replaced with anything all that compelling. There are suggestions of compelling ideas such as Pike being an imposter and Stamets being considered the Captain but they make for little more than insane ramblings. This would perhaps have benefited from more time devoted to it in another episode.